It’s very easy, quick and convenient create professional looking illustrations, diagrams for your documents, presentations and websites with ConceptDraw DIAGRAM diagramming and vector drawing software. 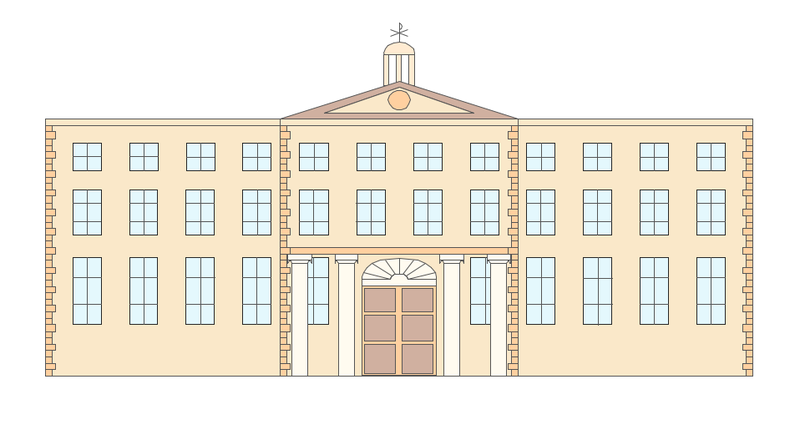 This picture shows the School clipart from the Buildings and Puzzles library of the Artwork Solution. Artwork Solution from the Illustration area of ConceptDraw Solution Park provides the libraries with large collection of ready-to-use predesigned objects, templates and samples to help you create visual and beautiful illustrations. ConceptDraw DIAGRAM v12 is a vector design software, it includes numerous vector stencils. Weather vector clipart library for ConceptDraw DIAGRAM v12 allows the user to produce professional-looking illustrations in seconds. The following examples cctv network were created in ConceptDraw DIAGRAM v12 diagramming and vector drawing software using the Audio, Video, Media Solution. Using this easily customizable cctv network template you can represent any existing cctv network. It’s very important for any establishment to have a fire exit plan and to train it several times a year. The plan must be put on each floor of the building in a way that it could be easily seen. To make the plan clear and descriptive, you should look through examples and then create one for you your building. Find out the fire exit plan example created with ConceptDraw DIAGRAM v12 and its Fire and Emergency Plans solution. This plan is a floor plan that shows the ways in which people inside the building can be evacuated in the event of a fire. The location of telephones, fire extinguishers and first aid kits are indicated on the fire exit plan. The Legend in the lower right corner of the plan makes it clear and easy-to-read. Such plan should be placed on the wall on each floor of the building. Computer networks nowadays are spread all across the world. The large number of parameters, such as geographic scale or communication protocols, can divide networks. One of the most common types of networks is called local area network (LAN). It convenient to represent network examples by means of diagrams. This local area network (LAN) diagram provides an easy way to see the way the devices in a local network are interacted. The diagram uses a library containing specific symbols to represent network equipment , media and the end-user devices such as computers (PC, mac, laptop) , network printer, hubs, server and finally a modem. There are two types of network topologies: physical and logical. The current diagram represents precisely a physical type of LAN topology because it refers to the physical layout of a local network equipment. Wisconsin is a U.S. state located in the north-central United States, in the Midwest and Great Lakes regions. The vector stencils library Wisconsin contains contours for ConceptDraw DIAGRAM v12 diagramming and vector drawing software. This library is contained in the Continent Maps solution from Maps area of ConceptDraw Solution Park. Few other areas benefited as much from the development of advanced digital drawing software as interior design. Previously only done by professionals, nowadays it is made available to virtually anyone with the help of software such as ConceptDraw DIAGRAM v12 You can design whatever you want - a living room, an office, a garage, a school layout - design elements provided by ConceptDraw DIAGRAM v12 fit all of these purposes. All you need to get started is your creativity and the right software tools. This library of vector graphic objects includes images of different school furniture and equipment related to school or training classes interior. These graphical elements are embedded into the ConceptDraw School and Training Plans solution. You can use them when designing interior layout of classroom or training office.Organization of the learning environment is an important element of a students learning. By using ConceptDraw DIAGRAM v12 you can easily visualize and present your ideas related to any classes layout. Tracking Olympic results in visual format is the most modern way to deliver statistics to a broad audience. This is a good example of an illustrated table you may easily modify, print, or publish on web from ConceptDraw Winter Sports solution .